John Christopher Jones, 50, of Gainesville, died peacefully on October 25, 2018 at Emory University Hospital surrounded by his family and close friends. He was born in Gainesville, GA on April 4, 1968. His father, Cecil E. Jones, Jr., preceded him in death. He is survived by his wife Mary Frances Little Jones, and his daughters, Frannie Jones of Charleston, SC, CeCe Jones of Asheville, NC, and Jettie Jones of Gainesville, GA. He is also survived by his mother, Jacquelyn Jones, his sister Robin Jones Cotton (David), his brother Eddie Jones (Joyce), his sister Lola Jones, his sister Paige Jones Knight (Rod), of Gainesville, GA, and his brother Brooke Jones (Amy), residing in Jersey City, NJ. He is also survived by his sister-in-law Paula Little, his brother-in-law Stephen Little (Dianne), his uncle Homer Jones, of Easley, SC, and many beloved nieces, nephews and other family. Chris was a 1986 graduate from North Hall High School, where he was an all-area offensive tackle. He graduated from North Georgia College in 1990 with a degree in Business Management. 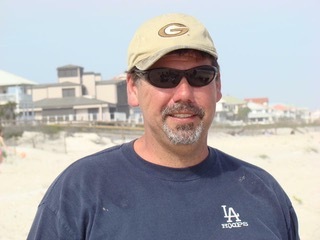 Chris was an avid whitewater canoeist, loved the Georgia Bulldogs and fishing on the beach. He will always be known for his lasagna, his barbeque sauce, and for getting people out of the Monkey Barrel with his leaf blower. He was a loving and supportive husband, father, brother, son and friend, with a great sense of humor and a larger then life personality. He will be sorely missed by all. We will be celebrating Chris’ life at 3:00pm on Sunday, October 28, 2018 at Grove Street Station, 610 Grove Street in Gainesville.